So, I purchased a new lens recently that I fell in absolute love with – a Sigma 50-100mm f/1.8 DC art lens. This particular lens is only for APS-C cameras with a focal length comparable to 75-150mm on a full-frame camera. This lens has quickly become my favorite portrait and indoor sports lens. The focus is fast, accurate and tack-sharp. I used it at the Muskogee Little Theater for some shots last week and was very impressed with the results. I typically use my Tamron SP 24-70mm f/2.8 for the theater, but I’ve noticed that sometimes my focus is a bit soft wide open, but the Sigma lens wide open at f/1.8 was much sharper. However, the Tamron 24-70mm does a great job for me at weddings where I have strobes set up for the posed shots and my speedlight for the ceremony. One of my favorite field sports lens (football, soccer, etc) is my Tamron 70-200mm f/2.8 Di VC USD G2 lens. With comparable focal lengths of 105-300mm, this lens is perfect for shooting high-school sports. This has also been my go to lens for head-shots. It also is tack-sharp on the focus and, although I’m usually set at 100mm for headshots, allows me to get a bit closer if I need to. For landscape and city-scape photography, I typically use a Tamron 16-300mm PZD Di lens. This lens opens to f/3.5 on the wide end and f/6.3 fully zoomed out, which is okay for landscape and city-scape photography. Because of the focal range, the is my go to lens for travel and vacation. 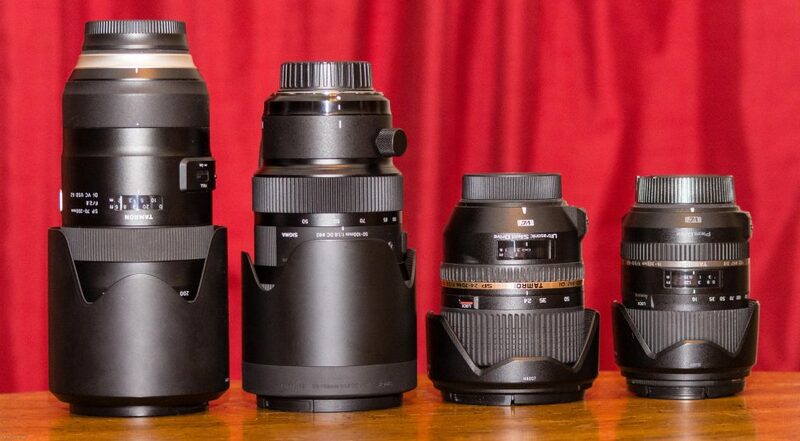 Of course, I pack all of these lenses when I travel because, well, you never know. However, when I, as the Aussie’s say, go walkabout, I will take one body and this lens. The only issue I’ve had with this lens is it will tend to creep on the focal length if I am shooting down. Gravity will do its job, so when carrying, I have to remember to retract the lens and utilize the lock, otherwise my lens grows like Pinocchio’s nose. So, yes, I have a lens for a lot of occasions, but that doesn’t stop me from a bit of lens envy at times. I’m sure you also have your favorite lenses and your go to lenses as well. The thing is, no matter which lenses you use, know your lens, know it’s capabilities and limitations – and you do that by shooting and shooting, then shoot some more. When I was about 14 with a Kodak Instamatic camera, I took pictures of everything I could and spent a lot of money on film and developing. That was back when I would buy a film cartridge, shoot it, drop it off at drug store or parking lot kiosk (now you know how old I am), wait a couple of weeks and pick up the negatives and prints. Only then would I really know if what I shot was good. I moved from that to a Petri 35mm camera that was fully manual. I set the aperture on the lens, the shutter speed on the camera, and for every film roll change, I had to set the film speed (ASA/ISO) on the camera. I had to manually focus using a split prism lens to know when something was in focus. I HAD to know how the shutter speed and aperture worked with the film speed to correctly expose AND, I had to trust the meter on my camera to let me know if I’m exposed correctly. I had a light meter, also, but really didn’t know how to use it at the time. Now it is an invaluable tool that I use almost constantly. I used this camera for many years and, in fact, I still have it. After getting married, having kids, and generally letting life get in the way, I put the camera down until about 2007. I borrowed a Canon Rebel and began shooting again, mostly vacations and such. This camera, of course, had a fully automatic setting that would allow one to be lazy, and lazy I was. It wasn’t until I purchased my first Nikon that I realized that if I want to take my photography to new levels, I needed to go back to fully manual shooting, or at least use some of the semi-automatic features of the camera. Then, I upgraded that Nikon to what I currently shoot, which is a D7200. I have nothing against Canon, but I’m used to Nikon and I have a LOT of glass for Nikon. So, the needs of each session defines what mode my camera is in, which is NEVER in full auto. In future posts, I will discuss the different modes and the ways I use them. I hope to keep this updated fairly often and I hope you enjoy reading.